The Wizard of Oz is a firm family favourite that is regularly on television. The Chuckle Brothers are also family favourites and it is interesting to see what happens when these worlds collide. Glinda The Good Witch (Beth Stobbart) happily lives in Munchkinkand, which is in the North, with lots of Munchkins. The show starts brightly with Pharrel William’s hit Happy which is a great platform for Stobbart. Dorothy (Lauren Varnham) appears from Kansas in her flying house that kills the Wicked Witch of the East. Not surprisingly this displeases her sister, who is the Wicked Witch of the West (Emma Francis) and the future doesn’t look good for poor Dorothy who simply wants to get home. Glinda and the Munchkins show Dorothy the yellow brick road which leads the way to the Wizard who will grant her wish to go home. So off she goes picking up a Cowardly Lion (Phil Corbitt), a Scarecrow (Adam C Booth) and a Tin Man (Danny Potts) who also needed dreams to be fulfilled. Appearing between the scenes are Barry Elliott and Paul Elliott who add jokes, songs and funny skits. As soon as they appear the audience are up for their kind of high jinks. Highlights include acrobatics and a cooking lesson which, needless to say, doesn’t go as planned. Another element of Darlington’s production, which seems to be uncommon in 2014, is a live band to back the songs rather than piped music. The show feels very genuine as a result, with the usual mix of popular songs, under the musical direction of Joe Morley. A number of children’s shows recently have featured 3D animation sets and their inclusion seems to be more of a gimmick. With Chuckles of Oz the two 3D sets seemed to meld better with the action and provided many laughs and screams as assorted creatures hurtled into the audience’s laps. This show benefits from a much stronger narrative than many classic pantomimes. Varnham is engaging as Dorothy, her companions are loveable and the evil witch makes a suitable source of booing for the children. Special mention to Toto the dog who never puts a foot wrong. It is the Chuckle Brothers that are the main draw and they don’t let the crowd down. Barry and Paul know what makes such an evening special for their many fans. 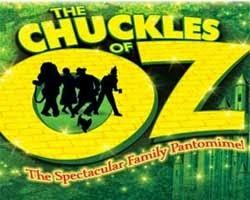 Chuckles of Oz is a great show which sparkles for the young and the young at heart. 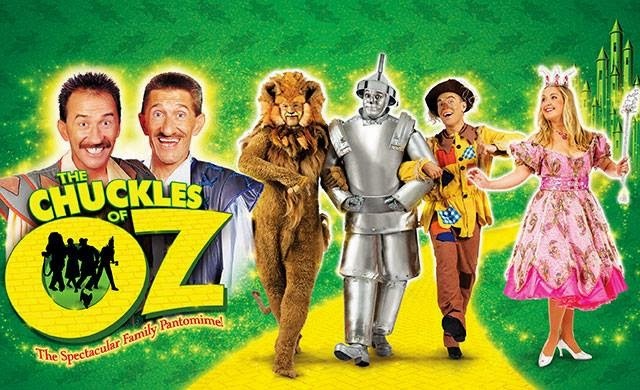 The Chuckles of Oz runs at Darlington Civic Theatre from Saturday 6 December 2014 until Sunday 11 January 2015.